Masala chai, a spiced indian tea and every Indian is familiar with this hot hot tea which is usually had at any time of the day in Indian households. ‘Tea’ Is commonly referred to as ‘chai‘ at Indian households and people drinking tea everywhere is a common sight in India and every part of India. There are various kinds of tea that are usually made like ginger tea, cutting chai, masala chai, normal chai, irani chai commonly made in street corners. Chai is something that almost every Indian can’t do without and to have a great start of the day we all love to enjoy hot cup of tea or coffee along with some chai biscuits. I am very fond of tea and would love to try out various kinds of tea. There are also some various flavors that are usually available in markets like tulsi flavored tea powder, ginger flavor, herbal tea and these are ready made available tea powders that do not require to take extra efforts to separately make them at home. But , not all places sell these spiced flavors of tea powder and we all usually get to buy basic tea powders in several brands. However, making freshly spiced tea at home is totally different from having it on streets. The chai made at home tastes even more better than the chai consumed on the streets. In India, every street corner has a chai stall and masala chai flavored tea sold is one among those flavors which is suitable to be had during heavy rains or winters. 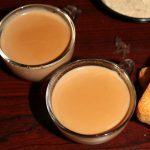 This chai is made with a specially made masala tea powder at home and it can be stored for a couple of days and used while making masala tea at home when ever required. To make this chai recipe, one needs to first make use of various Indian spices like cloves, cardamoms, cinnamon, pepper and dry ginger, powder them together and use it while making tea. Masala chai is usually made with water, milk, sugar, basic tea powder and masala tea powder which are all mixed together and boiled well. All the spices that are used to make this masala tea have lots of health benefits and when we think of masala tea the only thing that comes to my mind is of its many medicinal benefits. Although, there are many stores that sell ready made masala tea powder but, I would suggest to make it at home and store as it is very easy to make and healthy as well. If the tea is made without milk and using sugar, then one can have it as a miracle weight loss drink. It aids in digestion and good for tummy related problems. 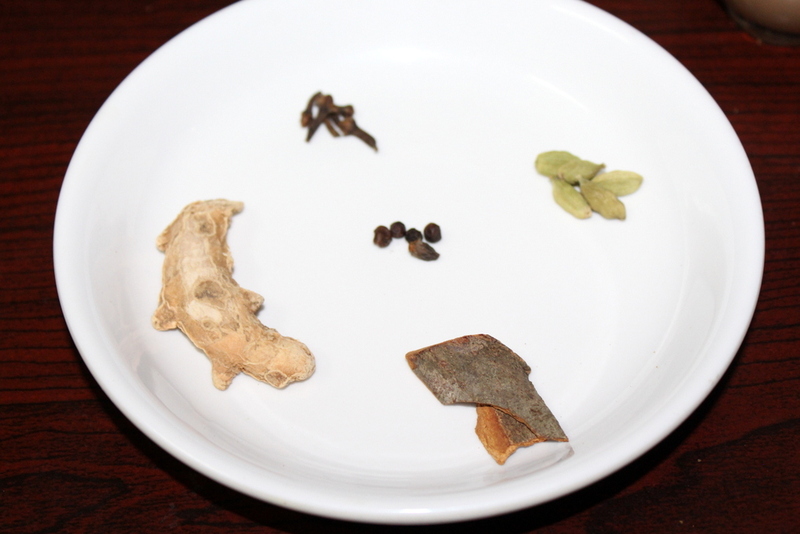 The tea uses dry ginger into it and dry ginger has many benefits like it helps in getting rid of cold, and cloves help in getting rid of cough. The masala tea helps in preventing cancer, boosts energy, aids in digestion. If sugar is skipped, then it is a very beneficial tea for those suffering from diabetes. Having masala chai is not only good for health as it uses many health beneficial indian spices but also keeps our body warm and a perfect drink to be consumed during winters and monsoons. Indians like to drink a hot cup of tea during mornings and also love to consume tea in the evenings with some hot hot pakodas or any instant snacks recipes. Below I have shared the miracle healthy hot drink recipe that one should consume often which is very beneficial to our body and can prevent us from various ailements like cold, cough, nausea as well as prevents us from various diseases. 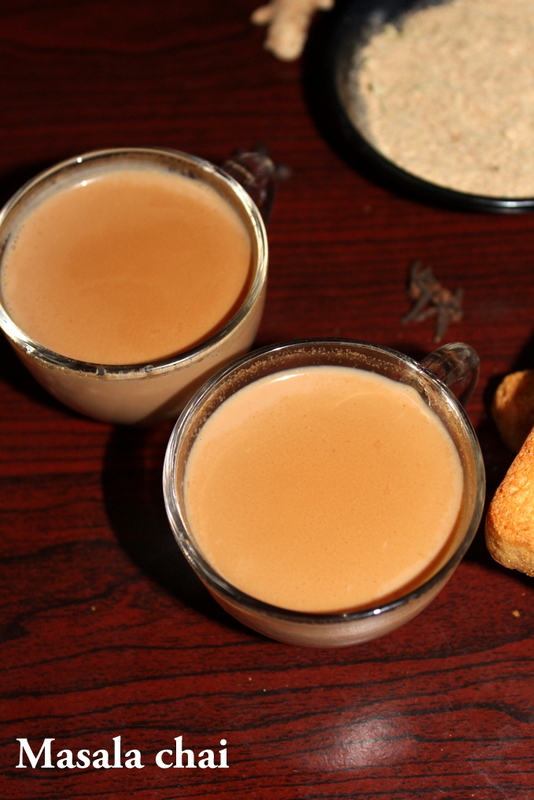 A quick and healthy chai recipe made using masala tea powder in milk and water. In a mini blending jar or grinding jar, add dry ginger and grind it into fine powder, now add cloves, cardamoms, cinnamon, kali mirch, grind it into a fine powder. Store this powder in an air tight container and use it while making masala chai. Take a sauce pan, into it add water. Add the spiced masala tea powder, bring it to boil. Add the normal tea powder and let it simmer and boil for few minutes on low flame. Add sugar as per taste and simmer on low flame for few minutes until it comes to a boil. Strain the chai into tea cups. Serve hot hot tea with biscuits. 1. 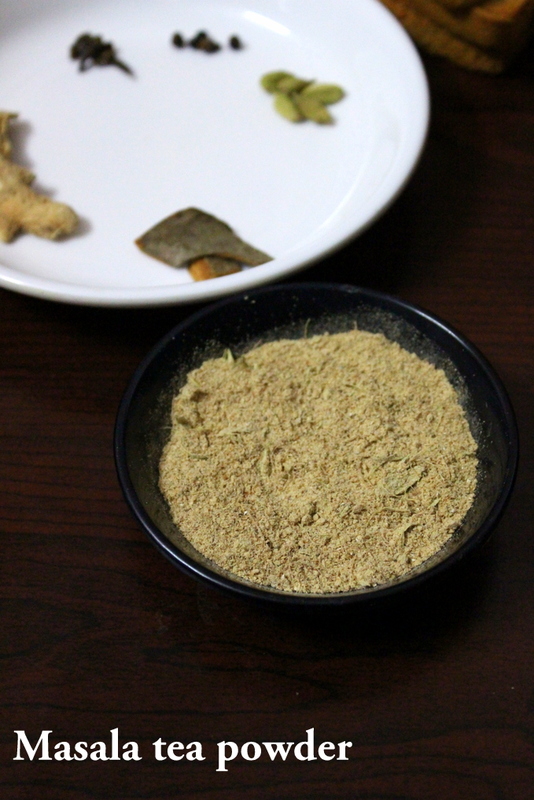 To make a strong tea, increase the quantity of basic tea powder while making tea. 2. Once can even skip sugar and have it as a sugar free chai. 3. Drink this tea often to enjoy its health benefits. 4. One can increase or reduce the quantity of milk and water as per requirement such as instead of adding 2 cups water and 1 cup milk, we can add 2 cups milk and 1 cup water. 5. One can increase or decrease the quantity of spices as per choice such as if one loves lots of dry ginger then add more of dry ginger and lessen other spices. 5. Sweetness of sugar can be increased or decreased as per taste. 6. If one is an expert in making tea then, add all the ingredients as per requirement and approximately. Thanks for sharing every bodys favorite tea recipes with masla marke, keep sharing such a new and interesting recipes.